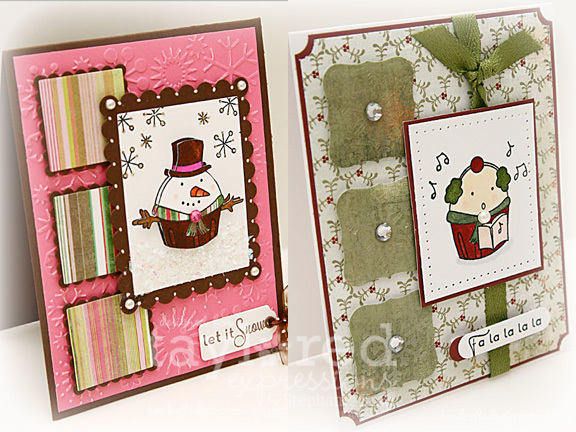 HandKrafted by Stephanie: TE Holiday Hoopla Blog Hop!! TE Holiday Hoopla Blog Hop!! 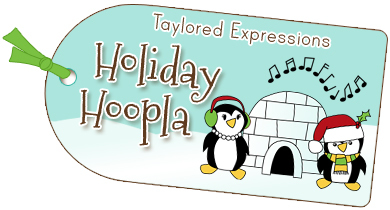 Taylored Expressions is hosting a Holiday Hoopla today, and I'm excited to be a part of it! You should have arrived here from Nancy McKinney's blog. If you didn't (or if you get lost along the way) you can head back to the beginning at Taylor's blog for the full list of participants. There are 22 designers showcasing Christmas/Winter/Holiday stamp sets from TE with samples that include all sorts of projects from cards to gifts and beyond! 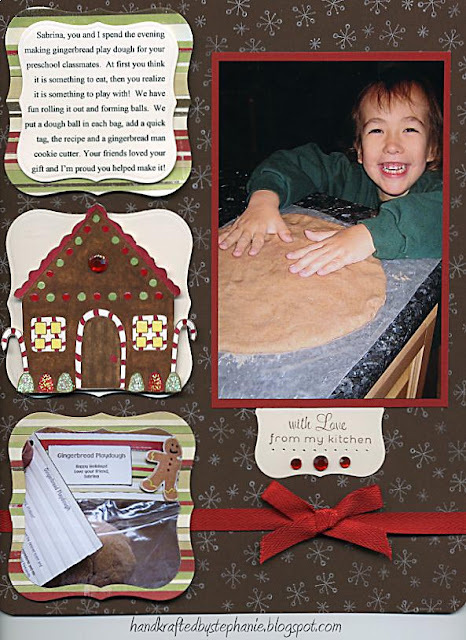 We want to inspire you to get your holiday crafting and card making into high gear! 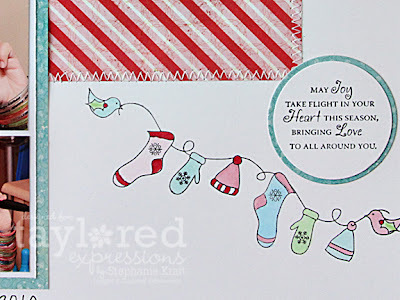 Be sure to stick with me all the way to the end of the post to get a coupon code for 25% off all holiday stamp sets at Taylored Expressions! The set that I'm showcasing is Wings of Joy. I love it because the images and sentiments are so sweet and whimsical! 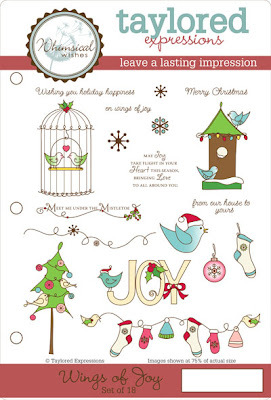 They are perfect for cards, tags and all sorts of holiday projects! Today I chose to make a 8.5" x 11" scrapbook layout. I had a few photos of my DD, Sabrina, from last year that I have been wanting to capture on a scrapbook page. Each year she receives a multitude of gifts from generous friends and family, and each year our little family is blessed by her infectious smile and sweet disposition. The two smaller photos are of her testing out her new camera (top) and karaoke machine (bottom). Along with the photos, I added a few of the happy images and sweet sentiment from Wings of Joy, which I thought were a perfect compliment to the story that I wanted to tell. Title of Christmas Joy -- "Christmas" created by using Thickers (letter stickers) left over from the TE May Key Ingredients (I have used these on a lot of projects and I still have plenty left for make more cards and layouts!). "Joy" created by stamping the sweet image from Wings of Joy, coloring it with Copic markers and die cutting it using the Take Note 3 die. The Take Note label is popped up with foam tape for a little added dimension. I added some rhinestone flourishes under the label for some festive bling. Creating for this hop caused to me to go back and look at some of my previous creations, and I wanted to share one of those with you today too. One of my first TE stamp set purchases was Home Sweet Home and to this day it is still one of my favorites! I was honored to be a Featured Cupcake Sampler of the week nearly 3 years ago and made a couple of cards and a layout using Home Sweet Home. To see my original post and for more details, please click HERE to go back to my original blog post. Are you getting in the mood to stamp? Be sure to check out Taylor's 12 Days of A Handmade Christmas Video Series for lots of easy gift ideas. Christmas Blessings, Enjoy!, From the Heart, Hangin' Out - At the North Pole, Holiday Wonder, Home Sweet Home, Keeping Tabs, Merry Little Cocktail, Penguin Pals, Season's Sweetings, Sparkle & Cheer, Tag Treats, Tag You're It, Take Note - Holidays, Wings of Joy, Winter Wonderland. Your next stop on the hop is to the fabulous, Lori Craig's blog. You will not want to miss what she has to show you! Accessories: Take Note 3 die (Taylored Expressions), Circle punches (EK Success), Markers (Copic), Thickers letter stickers (TE May Key Ingredients), Rhinestone flourishes, Foam tape, Thread, Sewing machine. Wow, Stephanie, you are so good at scrapping a page. . .LOVE these! Your daughter gets prettier by the day! Love the layouts Steph! What a FAB page Steph! Your daughter is SO beautiful! LOVE this! 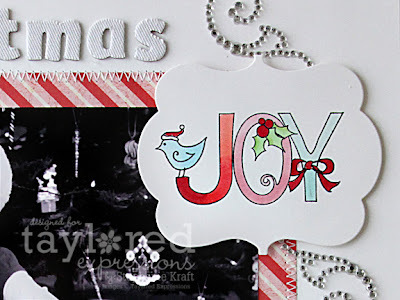 Gosh I love the way you used Wings of Joy on that so sweet scrap page!! Oh Stephanie. These are fabulous. Love the great lay-outs and how you used the images. The gingerbread house looks great with the photo. :o) Pretty cards too. OH goodness I love your pages! They are just wonderful. Great accents with the stamps and I LOVE your previous projects!! What great scrapbook pages!! The stamps make perfect embellishments! Oh wow Stephanie! Fabulous layout and all of the perfect details!!! What a perfect page! Just the right images to highlight your wonderful photos! What a great layout, Stephanie!! Lovely photos and love how the stamps work so well with it. Thanks for sharing you previous projects too. They are Awesome!! 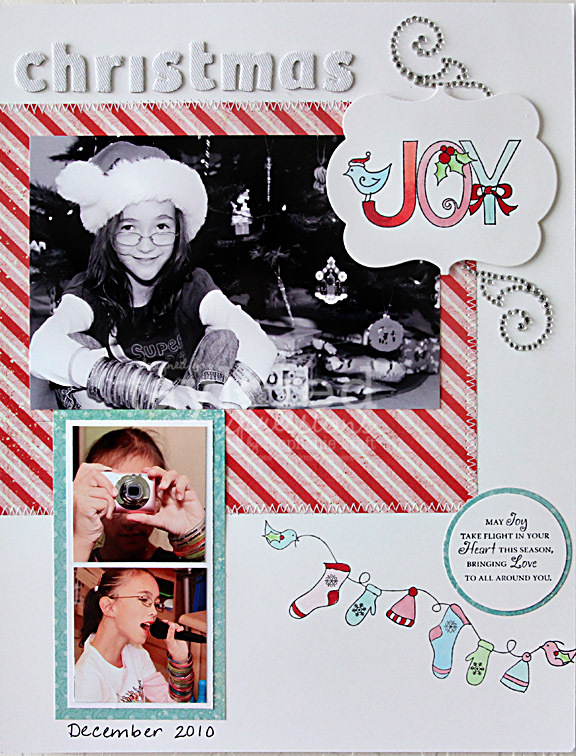 Oh my, Stephanie, what GORGEOUS scrapbook pages! I LOVE these! What a lovely layout! Your daughter is adorable! I love how you placed the photos, and these stamps are just perfect! Very inspiring :) I must scrap more often! Thanks! AMAZING, Stephanie! I LOVE seeing your scrapbook pages. They are always fabulous! This one is so cute and I love your layout and clean design.